During a meditation session, I had a vision in which I saw the image of Ganesha hindu god, also known as Ganapati. His trunk was in an upright position; and he was smiling. In his right hand, he held a lotus flower with a clear drop of water in the middle. After viewing this lovely image, I decided to paint a similar picture and share with the readers. After the vision and painting, I began searching for some logical interpretation. A friend, who was so kind, gave me the following interpretation. "This is my intuitive interpretation. GANAPATI with trunk in the air…………A greeting, the same way we say hello or hi to someone. Ganapati smiling. He is happy to see you. Just the same way we greet people we like and smile at them, because we are happy to see/greet friends. Lotus represents purity. Also constant movement of life (lotus is never steady on the water, gently swaying side to side). Nothing is still; everything is in constant motion in this world. Nothing remains the same. 2. Aspiration (when we begin to awaken and start our spiritual path, is the similar to the way the lotus seed begins to root and journey all the way up in search of the Sun –illumination-, finding its way up and away from the mud n murky water, out into the open). 3. Illumination (Yippee! Free at last, from the mud n dirty murky water and the fragrant, beautiful, captivating Lotus flowers shines on the water, and attracts the attention of everybody else…. just like the Soul, when free from ignorance becomes the Divine Being that it truly is, free from Ego etc…… Drop of water. Source of life. Without water we cannot live. Also, the water droplets on the lotus does not affect the lotus, it just stays a drop and gently slides away (similar to the story of water never staying on a Duck). The lotus is totally unaffected and detached by water droplets. The ideal man, is thus unaffected by cosmic maya and remains identifies with his higher Self and not the little self. It could be a drop of immortal nectar of the Gods also. But being on top of the lotus I would safely assume it as water……"
Although I was very pleased with the interpretation, I was hungry for more information on Ganesha. I began searching. The following is what I discovered. "Ganapati is one of the deities best-known and most widely worshipped in the Hindu religion. His elephant head makes him particularly easy to identify. He is known as the Remover of Obstacles and Provider of Prosperity. He is honoured at the beginning of rituals and ceremonies. His image is found throughout India and Nepal. Hindu sects worship him regardless of affiliations. Devotion to Ganesha is widely diffused and extends to Jains, Buddhists, and beyond India" (Wikipedia). Many believe that Ganapati is the Lord of all beginnings. 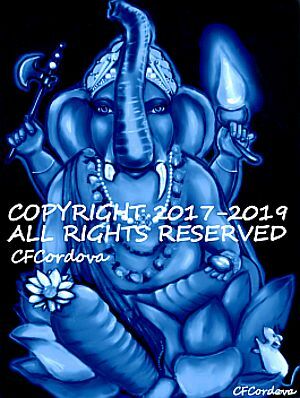 Although he is the remover of all obstacles, he is known to place obstacles in people's life in order for them to learn and grow. However, the most intriguing question for me was, how did Ganapati get an elephant head? Sources reveal that Ganapati was the son of Parvati and Shiva while other sources state that he was created by Parvati or Shiva. It is debatable. However, the tale that seems most popular is how Ganapati got his elephant head. One day, while Goddess Parvati was taking a bath, she told Ganesh to stand guard and not allow anyone to enter. Shiva, her husband, appeared. Ganapati refused to allow him in. A fight ensued, and Ganapati head was severed. When Parvati entered the room, she witnessed her headless son on the ground. She became extremely upset and sorrowful over the demise of her son. Feeling remorseful and wanting to comfort her, Shiva decided to amend his wrong deed. He gave orders to retrieve the first head founded, which happened to be an elephant. The elephant head was chopped off and placed on Ganapati’s lifeless body. He was revived. Ganapati's elephant head is a symbol of strength and wisdom. (The bulk of gathered information came from www.exoticindiaart.com) To be continued. Give me wisdom so I can be above the ignorance. Pull away the barriers which stop me from progressing. Make the divine opulence acting on my life. Give me prosperity so that I can help my brothers on Earth. Lord Ganesh, powerful as the highest mountain, sweet child's heart, noble as sunlight act like gold in my life. Click onamazon.com/author/carmen-cordova and start the journey.